Led by Artistic Director Matt Keegan, The Three Seas is an international, intercultural music project that fuses modern Australian jazz with the West Bengali folk tradition to create a unique and soulful sonic imprint that radiates joy. Drawing on the earthy tones of north Indian folk music with a focus on the Baul tradition, The Three Seas combines contemporary jazz and western production aesthetics to playfully create new pathways and transport audiences into new musical worlds. A project ten years in the making, the remarkable members of The Three Seas have been drawn together by a deep love of music, a mutual respect for their distinct and diverse cultural origins and a shared passion for creating songs that resonate universally. 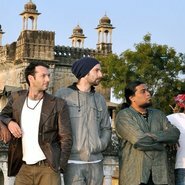 The band includes Matt Keegan (saxophone, clarinet), Raju Da Baul (vocals, khamak), Deoashish Mothey (vocals, dotora, esraj, guitar) Steve Elphick (bass) Gaurab Gaboo Chatterjee (dubki, drums). The Three Seas is supported by the Australian Government, the Australia Council and the APRA/AMCOS Art Music Fund. Image: Three of the members of The Three Seas.